Jars are the perfect size for jams, chutneys, pates. 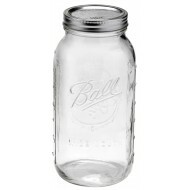 The cherry red lid would make these a beautiful jar to serve yoghurt with berries. Rubber Seals / Gaskets fit Fido and Le Parfait Jars Packet of 6 Rubber gaskets / seals designed for use with all sizes of Bormioli ..